Russia’s victorious Olympians have been presented with awards at a special sports reception in Moscow. Speaking at the event, several leading athletes spoke of their belief that the success of the Winter Games will now lead to a surge in interest in sports in the country. On Tuesday, May 20, at the Vetoshny Art Center in Moscow, there was a meeting of Olympic champions, medal winners at Sochi 2014, and athletes who will be going to the 2016 Olympics in Rio de Janeiro. The meeting, organized by four-time Olympic champion and chief editor of Bolshoi Sport magazine Alexei Nemov, was given the symbolic title of “Sochi – Moscow – Rio”. 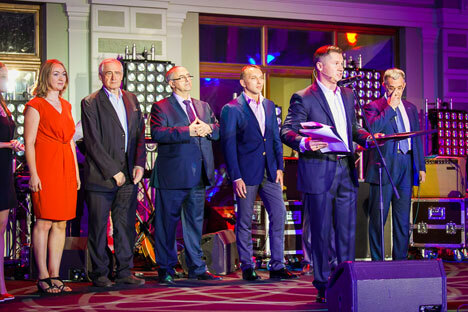 “We gathered those people who are helping popularize sports in our country,” said Nemov. “Watching live or on TV, short track speed skaters or skeleton racers winning medals, parents have started sending their children to [take part in] these previously unpopular disciplines. I’m not talking here about figure skating – the sections training for this sport are already struggling to accept all those who want to take part. That is what the Olympic Games are for,” he noted. In February 2014, for the first time in its history, Russia hosted the Winter Olympics (in 1980 the Soviet Union hosted the Summer Olympics). The Russian national team in Sochi managed to surpass the achievements of previous USSR teams, in terms of total medal count at the Winter Olympics, winning 33 medals: 13 gold (Russia repeated the USSR’s 1976 achievement), 11 silver and 9 bronze – thus setting a national record. Forty-nine Russians became medal winners, 26 of them winning gold. Nemov added that the sports facilities at Sochi had received top marks from experts, and fans had been impressed by the event’s convenience and logistics. “I spoke with stars of world sport, such as Ole Einar Bjørndalen, Sven Kramer and Dario Cologna. All of them said that the Olympic Games in Sochi, in terms of organization and entertainment, were the best in their sport careers. That means a lot,” said Nemov. The event was attended by the champions of Sochi: two-time Olympic champion figure skater Yevgeny Plushenko, figure skater Adelina Sotnikova and skier Alexander Legkov, and triple-silver medalist, luger Albert Demchenko. “I have competed in seven Olympic Games. Most of all I remember the first and last ones,” said Demchenko. “My debut at the Olympics was very exciting, but winning two medals in Sochi will also live forever in my memory. I have never performed in front of such a large Russian audience. The support they gave me was crazy. Demchenko expressed his confidence that the new sporting facilities built for the Olympics would be invaluable to new generations of would-be Olympians. “Many sports facilities were built for the Olympics and now young athletes will be able to use them for their training. Now they will not have to travel abroad. This is a big step forward,” he said. All athletes present at the event also received awards. Russia Beyond The Headlines, the informational sponsor of the event, presented the award “For the popularization of Russia in the world as a sports power”, given to Olympic champion and multiple world champion in synchronized swimming, Anzhelika Timanina. “The athletes of the Winter Olympics passed us a kind of baton. We will try not to disappoint Russia, and strive to achieve great results in Rio in 2016,” said Timanina. “Taking first place in the overall standings will not be an easy task, but we will make every effort to achieve it. “I spent a lot of time at the Olympic Games in Sochi. The atmosphere was so exciting that I did not want this festival to ever end,” she said, adding that the victories achieved by the country’s Olympians were a victory for Russian sports. “I feel confident that now the competition for getting into the national team for winter sports will seriously increase,” said Timanina. According to Olympic champion skier Alexander Legkov, the games in Sochi will help revive team sports. “Team sports were well developed in the Soviet Union - hence such great results were achieved by Soviet athletes at all Olympic Games and the world championships in team sports: football, basketball and volleyball. We need to revive these traditions. “On the back of our success in Sochi, this will be much easier to do. If not tens of thousands of people, as is the case today, but hundreds of thousands, even millions, were engaged in skiing, then we would have won a lot more medals. And this applies to all sports,” said Legkov.